Add a dose of Las Vegas glam and gambling to your Orlando getaway. Come experience the excitement aboard Victory’s 40,000 square feet with four decks filled with true Vegas style gaming including over 600 slots, 27 table games, Craps, Roulette, Blackjacks, Sports Book and more! Only 50 miles from Orlando to Cape Canaveral. Complete gaming optons include slots, blackjack, live roulette and craps, plus EZ baccarat, and bingo. For poker lovers, there are 3-card games, as well as the popular Texas Hold ‘Em. In addition to the gaming options, Victory Casino Cruises offers a wide variety of entertainment options. Two dining rooms (one full-service buffet and an a la carte option), five bars, including an outdoor deck with live entertainment, and Big Norma’s Club V, a lounge with Florida’s finest musicians, DJs and live acts. 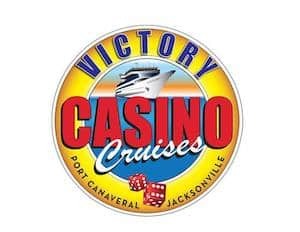 Come on out to Port Canaveral and enjoy an afternoon or an evening with Victory Casino Cruise Lines! They are the Space Coast’s only casino gaming opportunity. Victory Casino Cruises sail 7 days a week, sailing 2 daily cruises. Victory’s fun and contemporary atmosphere provides the perfect setting for a day of friendly gambling and playing the slots, as well as dining on a sumptuous buffet and drinking a couple delightful cocktails! Bring the whole gang and make a day (or night!) of it! It’s the perfect opportunity to kick back and relax with your whole gang, knowing there’s something there for everyone to enjoy! Feeling lucky? Try your hand on the slots. Push a button or pull a lever and watch for your payout. We have over 600 “loose” slots on board—meaning high payouts! It’s addictively fun and requires no skill! Sign up for the Victory Card to earn points while you play, redeemable on food, drinks, and boarding passes. Plus, you can earn free slot play! Place your bets! “LIVE” American roulette — probably the easiest table game to play. Guess where the ball will land! In addition to our “Live” tables, we also have digital roulette tables available for your pleasure. Players love this game and it’s easy to understand why. 3 Card Poker is a fun, fast blend of poker. Always a casino favorite. The payout is a cool 50-to-1 if you hit a “Mini-Royal”. Our Three Card Poker game includes the optional 6 card bonus wager that pay 1000 to 1 for a Royal Flush! The only Sportsbook in Florida. Sit and watch the games on big screen TVs. Las Vegas lines to wager on all sports activities — pro and college — including basketball, football, baseball, soccer, boxing, MMA, hockey, and more. A thousand-year-old fast-moving dice game that attracts both young and old. Whether it’s snake eyes or boxcars, try it and you’ll love the action! We have 3 LIVE Craps tables with hot dice action at 5X odds. You don’t have to be 007 to enjoy this one. EZ Bac is a commission free Baccarat game that features the Dragon side bet that pays 40 to 1 and the Panda side bet that pays 25 to 1. EZ Baccarat tracking information is displayed on our large, full color, animated score board. Mississippi Stud is a 5 card poker game that lets players bet up to 10 units on a single hand. Players play against a pay table, not against the dealer. The top payout is 500 to 1 for a Royal Flush! It also includes the optional 3 card poker wager. Easy to play, easy to learn! Players make 3 equal bets and receive 3 cards that will be combined with 2 community cards to create a 5-card poker hand. After seeing their first 3 cards, players may withdraw their first bet … or “Let It Ride.” This game gives players the rare chance to decrease or withdraw bets. Our Three Card Poker includes the optional 3 card poker wager.